Securing our border with Mexico—the main crossing for undocumented immigrants into the United States—is a vexing challenge. Technology—in the form of a “virtual fence” of sensors, cameras, motion detectors, and other sophisticated equipment—is considered to be of the utmost importance in stemming illegal immigration. But problems have plagued the effort for more than two decades, raising questions about whether it can be done effectively. The outgoing Bush administration last year bequeathed to the incoming Obama team a border security program replete with vast technology problems accompanied by outrageous cost overruns and missed deadlines by the main contractor on the project, Boeing Co. Sadly, the Bush administration proved it had learned little from earlier failures to control undocumented immigration along the border stretching back more than a decade, and showed it had a poor handle at best on government contracting at the thennew Department of Homeland Security. This left the Obama administration’s new team at DHS with a decision about whether to fix the persistent known problems piled high with new ones added by the Bush team or to try something different. Secure Border Initiative (SBI) is a comprehensive plan to control our borders and stem the flow of illegal immigration through an integrated mix of increased staffing, more robust interior enforce- ment, greater investment in detection technology and infrastructure, and enhanced coordination on federal, state, local, and international levels. A critical component of the SBI strategy is SBI- net, a program focused on transforming border control through technology and infrastructure. In March 2010, DHS reached a pivotal moment in determining future border enforcement and surveillance policy. Signaling its discontent with the mismanaged, cost-overridden technological component of its border enforcement strategy, DHS froze work on the “virtual fence” along the U.S.-Mexico border pending a full assessment of its usefulness. At the same time, DHS Secretary Janet Napolitano ordered the redeployment of $50 million of Recovery Act funding to other “tested,” commercially available security technology, including mobile surveillance, thermal imaging devices, ultra-light detection, backscatter units, mobile radios, cameras and laptop computers for pursuit vehicles, and remote video surveillance system enhancements. “Not only do we have an obligation to secure our borders, we have a responsibility to do so in the most cost-effective way possible,” Napolitano said. This last component, SBInet, quickly became the one most beset by difficulties. SBInet was intended to improve security between ports of entry and where the physical fencing is not in place by installing remote video surveillance camera systems and sensors and adding aerial assets such as Unmanned Aerial Vehicles. Boeing, a major defense contractor and commercial airplane manufacturer, was picked by DHS’s Customs and Border Protection in September 2006 to lead SBInet. Boeing beat out three other large defense contractors—Lockheed Martin Corp., Northrop Grumman Corp. and Raytheon Corp., as well as Ericsson Inc., the Swedish telecommunications giant—to win a three-year contract with three additional one-year options, despite misgivings about its lack of experience with border control issues The worries about Boeing were prophetic. Just before Napolitano’s recent decision to reassess SBInet, DHS estimated the “virtual fence” would be fully deployed along the southwest border in 2016—more than a decade after it was first announced and seven years after the original contract for the program expired. The GAO reported last year that SBInet’s delays required DHS to rely on existing equipment, rather than using newer technology. The more modern equipment suffers from numerous problems, including poor camera clarity in bad weather and mechanical failures with radar that leave it unable to spot intruders. Federal auditors followed up in March with an even more damning report, observing that from March 2008 to July 2009, more than 1,300 defects were found in the SBInet system, and new problems were being discovered at a faster rate than repairs could be made. Additionally, about 70 percent of the procedures to test the system were rewritten as they were being executed, prompting a letter from DHS to Boeing that asserted that testing changes appeared to be designed to pass the test rather than qualify the system. While DHS has been challenged to improve its oversight over Boeing, it also has missed some of its own deadlines, particularly those surrounding the troubled SBInet. Mark Borkowski, the DHS official in charge of the project, acknowledged at the start of 2010 that he would be unable to meet a promised March 2010 deadline to the House Appropriations Committee for turning over an initial portion of the project in Arizona to the Border Patrol. In its most recent audit in March 2010, GAO stated that the long-delayed first two “blocks” of the system are now scheduled to be handed over to the federal government this fall, if Customs and Border Protection approves the timeline. “At the current rate of 28 miles of SBInet technology every 4.5 years, it would take 320 years—or until the year 2330—to deploy SBInet technology across the Southwest border. That statistic would be comical if the subject matter were not so serious,” said Rep. Henry Cuellar (D-TX), chairman of the Subcommittee on Border, Maritime, and Global Counterterrorism, during a hearing to receive GAO’s study. Nor are DHS border challenges exclusively technological. The department also is charged by Congress with building a physical fence covering one-third of the 2,000-mile border with Mexico—an ambitious project, the costs of which have risen from $3.5 million a mile to $6.5 million a mile. A separate form of fencing aimed at keeping out vehicles also has risen in cost, from $1 million to $1.8 million per mile, and GAO officials say the impact of both types of fencing has not been adequately measured. “We have yet to see whether or not this fencing has increased border security and justified its costs,” says Rep. Loretta Sanchez (D-CA), the past chair of the House Homeland Security Committee’s panel on border issues. Those concerns also have been shared by many members of Congress, as well as Napolitano, who first opposed the fence while serving as governor of Arizona, a position she held before being named DHS secretary. Even though the Obama administration has worked around the prominent SBI setbacks and pushed forward with increased staffing, major construction, and revised detention and removal procedures, the focus on the costly border fences and SBInet play into the political hand of opponents of comprehensive immigration reform. Congress received in February the Obama administration’s proposed budget for Fiscal Year 2011, which included a severe funding cut for SBI, budgeting $574.17 million, down from $800 million it got the previous year. No one expects the physical fence alone can keep out illegal immigrants, which is why SBInet remained so important despite its numerous failures to meet the benchmarks for success that it promised at its start in 2005. Questions from Congress and government auditors regarding the usefulness of the physical and “virtual” barriers erected along the southwest border will continue. So is the SBI program, and especially SBInet, salvageable? Or more to the point, after so many years and so many dollars invested in this project, have we learned enough about what went wrong that we can create a credible border policy around what now exists alongside what we know needs to be fixed? 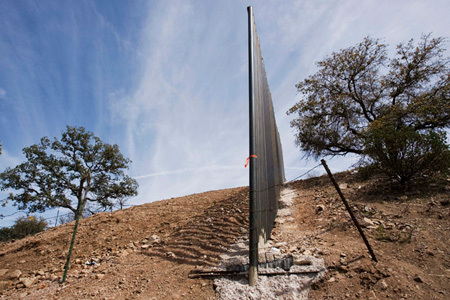 To examine border security infrastructure, the Center for American Progress interviewed lawmakers, congressional staffers, DHS and local government officials, as well as homeland security, immigration and technology experts, reviewed transcripts of congressional hearings, and visited the Texas border. We come away from our investigation aghast at the serial failures in the SBI program but also confident that parts of what exists are in fact salvageable and that what we’ve learned will help our country create a working border policy. We will detail our reasons for these conclusions in the main body of the paper, but the upshot of our investigation is that CAP does not support scrapping the concept of border security technology (using cameras, sensors, and other elaborate tools to monitor illegal border crossings) but the Obama administration and Congress must incorporate lessons learned from SBI’s repeated failures. Those range from greater cooperation on technology issues with Mexico to viewing enforcement as a two-way challenge with stepped-up inspections of traffic leaving the United States so that the recovery of smuggled cash and other proceeds can fund the ongoing technological upgrades that will be required. Most importantly, these efforts must be accompanied by the enactment of comprehensive immigration reform, which would create orderly migration channels and allow the border patrol to focus on smuggling and other criminal enterprises. By restoring order to our nation’s chaotic and broken immigration system, DHS’ operational control of the Mexican border will be enhanced. Congress should address border security through comprehensive immigration reform legislation. As Napolitano said at CAP last year, current laws do not provide what DHS needs “to do its job as effectively as possible,” and comprehensive immigration reform is required to expand its enforcement strategies. Specifically regarding border issues, a new law could reduce the inflow of illegal immigrants and lessen the constant pressure on border technologies, while also creating new revenue streams to fund technology upgrades. Continue to pursue technological solutions. Technology remains important to securing the border, and the general concept of fences, cameras and sensors can work if they are successfully integrated with each other. Reach out to local communities. Border towns need to be brought into the discussion. Though the Border Patrol does outreach as part of its day-to-day operations, it should ensure those efforts include SBI or whatever may follow if the current SBI program is dismantled. In particular, law enforcement officials in communities near the fence must get greater attention in addressing border security—not just through vehicles and other equipment, but through funding that can boost staffing levels at busy jurisdictions. Collaborate with Mexico on border security. Greater efforts should be made to bring Mexico, the country that is the primary source of illegal immigrants, into the planning process. One proposal worth considering would form a Binational Border Authority with a joint budget and staff and address issues stretching beyond law enforcement and security. Draw on the expertise of academia and industry to shape a long-term border security blueprint. Colleges and universities are studying various border security models that may highlight innovative solutions. The federal government should maintain tight control over the performance of contractors and agencies, while setting schedules with the understanding that they may need to be adjusted. Potential problems with contracts and contractors should be dealt with before they become issues to be discovered by outside investigators and auditors. Allow a wider variety of businesses, including small technology companies and unsuccessful SBI bidders, to join in solving border security problems. Innovative ideas often come from small firms. Improve interagency communications and planning and maintain flexibility in technology design. DHS’s ongoing review of the SBI program should consider recommendations for improving inter-agency communications, planning, and development so that potential problems are identified earlier in the process. The federal government should consider a more “horizontal” approach in which a single type of technology is implemented over a broad area. Given early technology failures, a “walk before you run” approach that gradually applies the tools along the border will have more success than hurriedly installing all of the work in a limited area. Improve the viability and performance of border technology programs. Additional funding should be given only after the project is ready to build out. We suggest that the agency use CAP’s recommendations as a template for beginning to repair what is broken, including adding transparency and accountability of the project. If, after careful review, DHS and Congress determine the program is salvageable and should proceed, then Congress should create additional revenue streams. In the pages that follow, this report will detail the legacy of border enforcement problems stretching back to the 1990s, examine in detail what went wrong, and then present our recommendations of what must be done to fix the problems. We’ll repeat this analytical exercise when we look at our ineffective border controls, the misguided government contracting work under the Bush administration, particularly productivity and projectmanagement breakdowns, and more recent problems that are surfacing since the Obama administration took office. In the end, we believe our recommendations about what must be done about border controls and immigration will persuade Congress and the Obama administration to act this year on this critical problem confronting our nation. The problems and challenges experienced by the SBI program over the past decade are not unique to this program. There are also broad lessons to be learned from this experience about how to effectively implement large programs. A broader view of the planning, implementation, and management of SBI offers lessons that can be applied to large government projects now or in the future. The second lesson: Determine which solutions are likely to be most effective in accomplishing the vision, including technological and other options, and accurately measure their viability. Think broadly about the different options that can be employed to promote the program’s goals. Technological solutions are likely to be but one part of a plan that succeeds. Case in point: Well into the development of the SBI program and its SBInet component in 2009, CBP had measured the miles of tactical infrastructure constructed and offered an analysis showing where fencing is more appropriate than other alternatives, such as more personnel. But the conclusions were based on the subjective judgment of senior Border Patrol agents, costing the project valuable credibility. The third lesson: Involve a range of interested parties and stakeholders from the outset. Increased collaboration with interested parties results in greater innovative ideas and solutions. Local communities, neighboring countries, universities, and the private sector can offer valuable insight and perspective throughout the process. Their buy-in can also be integral to the success of the program. Case in point: On the U.S.-Canadian border, researchers have found evidence that the history of international cooperation between British Columbia and Washington state through formal institutions such as the Pacific Northwest Economic Region economic development group has helped foster a collaborative culture. The fourth lesson: Set realistic goals, budgets, and timelines, not letting them be dictated by political expediency. Even a poor political decision may result in a productive program if project planning includes room for interagency communications and design flexibility. Case in point: DHS rushed to hire Boeing as a primary contractor for SBInet without fully considering its capability to carry out the project, largely because of enormous pressure from conservatives in Congress to move boldly and quickly in border enforcement. That led to unrealistic goals and poor management. The fifth lesson: Monitor progress vigorously to build confidence in the work and be prepared to be flexible where necessary to accomplish the goals. The key to a successful project is the maintenance of tight control over the performance and spending of contractors and agencies so that intermediate deliverables are completed in functioning order, on time, and on schedule. Case in point: SBInet is a prominent example of how not to do a major project. Not only was it inflexible where it should have been flexible, its lax control over performance and spending has left auditors and other key officials questioning whether any of its parts are salvageable, or are instead a giant waste of taxpayer dollars.